It always surprises me what a difference a few miles can make. West End, on Grand Bahama Island, a mere 50 miles from Palm Beach, Florida, feels worlds away. The lights of south Florida are still visible on the horizon, but your heartbeat slows the moment the boat pulls into the inlet on West End. if that makes sense. While many of the local homes prefer a coat of bright green, vibrant blue or pastel purple, Nandana’s main building and bungalows are tucked back from the road, surrounded by heaving palm trees. The builders left the natural wood untarnished, and the deep, earthy tones flow into the landscape rather than pop out like the colors of the nearby homes. When you walk up the drive, you feel as if you could be looking at an Asian beach house somewhere on the shores of Burma. The owners went to great lengths in constructing the main house and guest homes, which all feature high roof lines, exquisite teak work and a view of the open ocean from nearly every room. All of the walls and ceilings are covered in teak planking – not veneer, the real deal. 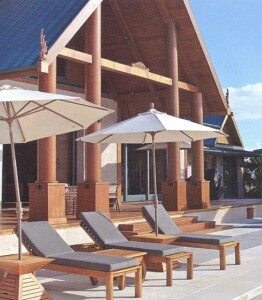 The teak came straight from India to the Bahamas in whole-log shipments. Then, the builders in the Bahamas set up a mill where they handcrafted each plank. The main house features a luxurious kitchen (with two professional chefs), a main dining area, a sitting area and an incredible view of the ocean over the infinity pool. I felt like the richest man in the world as I put back a few Kaliks after a long day on the water and watched the sun dip into the ocean. The rooms are all self-contained units with great views, private baths and outdoor showers. I, however, chose to stay in the tent on the canal side of the property, but calling this structure a tent is sort of like calling St. Peter’s Basilica a church. This tent is not something you’d pitch in the woods. It’s more of an upscale safari model with 20-foot ceilings, a king~size bed, a living room, an office, a full shower and air conditioning. I slept with the window flaps open, however, listening to the ocean and the birds. The ocean breeze kept the room at a perfect temperature. The builder also installed two private slips right next to the tent, with concrete bulkheads and deep-water access. The resort owns a 45~foot Ocean Yachts model named Lioness, which provided our daily entertainment. Capt. Cedral Williams motored us out of the inlet, where the depths quickly fall to more than 1,000 feet. We never even got the boat up on plane, and the outriggers came down just as we rounded the mouth of the channel. We trolled the edge right in front of the resort, along with two or three boats out of Old Bahama Bay, the neighboring marina. We fished so close to the resort that we were able to drop off a seasick passenger and be back in the blue water in less than 30 minutes. for, and an abundance of weed in the water made things a bit challenging. We worked our butts off clearing the lines all day. While West End does not offer the best marlin fishing in the Bahamas, you can still get plenty of shots at blues, especially during the summer. Just before lunch, a mystery fish blew up on the right long, tearing line off of the Penn 30 but coming unbuttoned right after the initial run. It happened again 10 minutes later on the same lure. 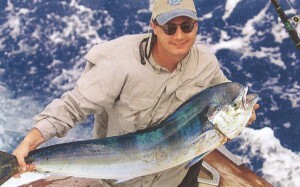 Frustration reared its ugly head shortly before I finally came tight to a nice bull dolphin to get the skunk off. You’d think the crew had never seen a dolphin, judging by their excitement, which kept the entire party entertained. The people back at the resort could probably hear the mate’s whoops and hollers. After catching a handful of barracuda, we decided to call it a day. That night, the chefs prepared the dolphin in a range of styles, each one better than the last. They grilled up a surf-and-turf dish, searing the dolphin alongside some flank steak. They also fried up some dolphin fingers and created a killer ceviche, adding some fresh conch to the fish. That meal, served open-air, was the highlight of the trip for me. for bone fish. The cloud cover made it extremely tough to spot the bones, but we did manage a few casts to some fish . We didn’t generate any hookups, but I really didn’t care. It’s tough to get upset while fishing in such a setting. From the food to the accommodations, Nalldana offers its guests a taste of what it’s like to travel to the finest resorts of the Orient, within a stone’s throw of the States.